I've had a couple lessons now where I get towards the end and then am just constantly fed the one or two sentences on the microphone that will not register. They're all the bigger number words (I'm stuck on одиннадцать right now), but no matter how I try or how closely or listen or try to pronounce it it just won't register. I know the easiest thing would just be to turn the microphone off, but I'm quite fond of it. Any suggestions? Is my pronunciation really just that terrible? A thought that just occurred to me; since the speech recognition can be a bit dubious anyway, how about turning the microphone off and just repeating the Russian sentences/reading your translations into Russian (or the correct alternates when you make mistakes) out loud. You'll still get speaking practice, but you won't be stalled out. That might not suit you, but I thought it was worth offering up as a possible (if less than ideal) solution. That's really weird. I'm almost certain that our course does not use/support speech recognition exercises. Are you sure you don't mean listening exercises? I swear I'm getting microphone exercises. I don't know if it's an A/B test or what. I wasn't getting them for the first couple weeks, but then I signed on one day and suddenly they were showing up. It's the same audio exercises as in the main five courses, and I thought it was super strange because I had never seen them in one of the incubator developed courses. Here's a picture. My background is black because I use the Duolingo Dark script. Interesting, I thought only in house courses have microphone exercises. I just turned on the microphone and I got these exercises as well and so did a fellow contributor so it cannot just be a bug. Because I mostly use my desktop for Duolingo and I don't have a microphone for it so I don't use these exercises. I usually just say the sentences out loud to practice pronunciation. As for pronouncing longer words, I find it helpful to try and break the word into smaller chunks and master the chunks before I attempt it as a whole. I would imagine something like this couldn't be a bug, because it would probably take a lot of programming to implement. It is strange they didn't talk to your team before adding the exercises, and I wonder why Russian out of all the beta courses got microphone exercises. Is Russian Difficult For An English Speaker To Learn? 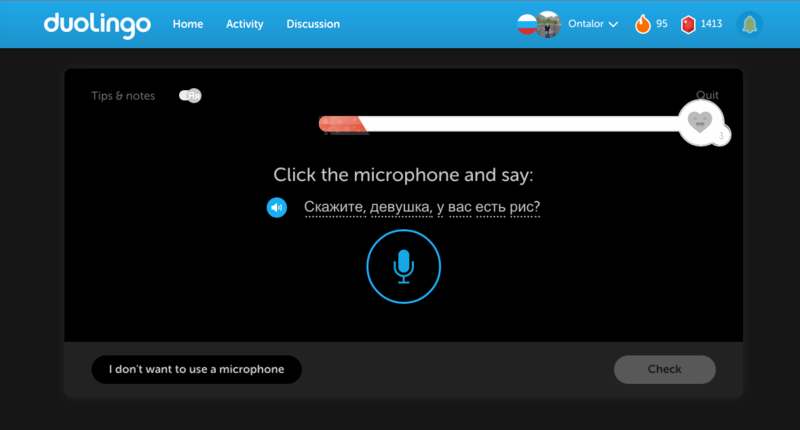 What about microphone excercices on the Russian new language package? Huge thanks for the beta! !